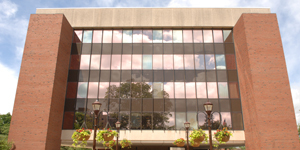 DeGarmo Hall is home to the College of Education and to the Department of Psychology. DeGarmo Hall, opened in 1972, was named after Charles DeGarmo (1849–1934), a Principal of the Grammar Department of the Model School from 1876–1883. DeGarmo graduated from Illinois State Normal University (ISNU) in 1873 and began his career as a prolific writer by co-authoring a language book. After seven years at ISNU, DeGarmo left for Germany for three years of advanced study. He then came back to ISNU as a Professor of Modern Languages and Reading. In 1881, DeGarmo published The Illinois School Journal. There are carillon bells at the top of DeGarmo Hall that chime on the hour from 8 a.m. to 6 p.m.